Below is Hamyang’s response to our petition: Hamyang, South Korea, Shut down the illegal dog meat farms, slaughterhouses and markets. The file they attached named “0115petitionresult of illegal dog farming.hwp” of “Guide to Petition Handling Results file” is blank. They claimed that it appears that there aren’t any dog farms, slaughterhouses or markets in Hamyang County. However, unless they can provide us with the records of their inspections and investigations of dog meat industry, it will be hard for us to validate their claim, since there are many dog meat restaurants and so called “Health Food Shops” which commonly do sell dog and cat elixirs openly operating in that county. We watched the documentary about illegal dog farms mentioned in the petition application, and we are well aware of the existing animal cruelty issue. 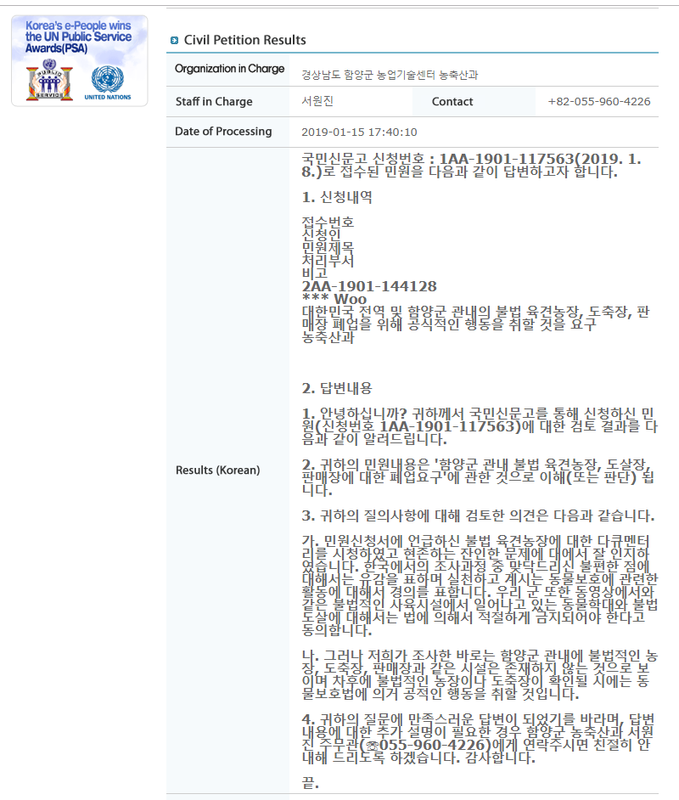 We are very sorry for the inconvenience you have encountered in the course of your investigation of Korea’s dog meat trade and we pay our respects to your animal protection activism. Our county agrees that the animal abuse and illegal slaughter that are taking place in illegal dog farms documented in the video must be properly prohibited by law. However, based on our investigation, it appears that there aren’t any illegal dog farms, slaughterhouses, or markets within the Hamyang county, and if illegal farms or slaughterhouses are found later, we will take action under the Animal Protection Act.